I’ve been on a parent planning committee associated with our high school’s Teens for Life group, and knew the exciting news at school year’s end last year that our school had been selected from all the schools in the United States to carry the front banner for the 2015 March for Life event in D.C. I knew also that the main organizers had big ideas about this year’s march. What if we made it possible for every single student from our Catholic high school to be able to be part of that banner-carrying moment? After all, how many chances does one have to carry a banner that will lead a march of some 500,000 or more people at our nation’s capitol, and for a life-giving cause? I knew, too, that for the past several years, this teen group has organized an event called Cupcakes for Life to raise funds to help make the trip possible for those who want to attend; that they ask a speaker to come to make the night extra special; and that they wanted this year’s speaker to be extra-special special. After all, the person would have to be prominent enough to double the size of the usual event in order to raise enough funds for every student in our high school to have a chance to go. Which would be an historic move. Never before has an entire high school emptied out of regular classes and athletic events for such a cause. When I found out several weeks ago the name of the speaker who had agreed to come to humble Fargo for this cause, I was as ecstatic as the rest of those working behind the scenes to make it happen. 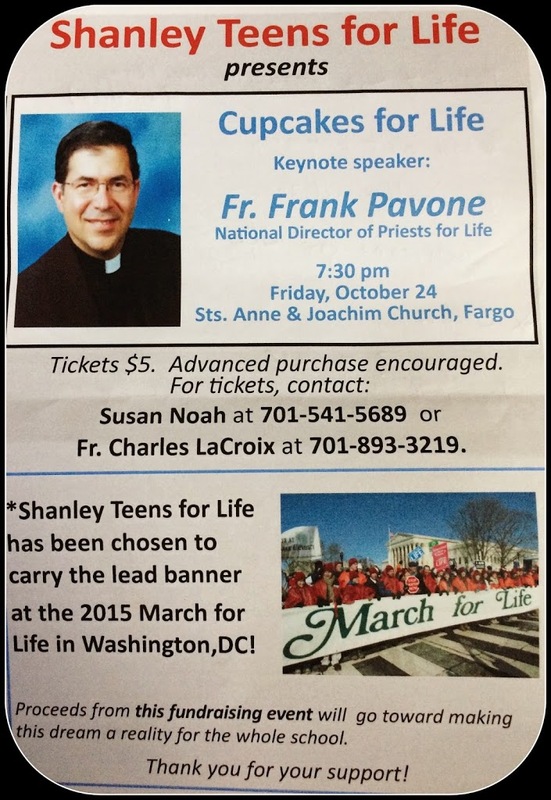 Father Frank Pavone is one of the, if not THE, most prominent pro-life speakers in the country, and maybe even the world. And yet he agreed to come to our city, to our parish, to our school, and do what he could to stoke the fires of love and incite the next generation toward a life-giving mindset, to pray for an end to abortion, to more assuredly bring about a culture of life, not death. Father Frank’s coming to Fargo, and if you’re in the area, there’s no better reason to satisfy your sweet tooth and get an injection of inspiration. I’ve heard Father Frank speak a couple times before, and each time, I felt completely jazzed about our beautiful mission: creating a world where no babies die and no mothers cry. 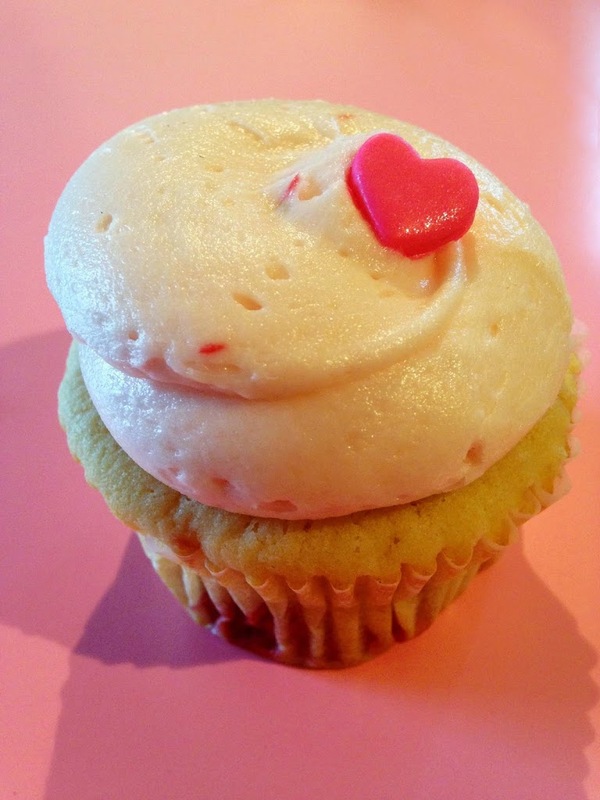 Yes, despite what some say, we sincere pro-lifers have a heart for the babies and the mamas, too, and we want to change the world, one heartbeat, one cupcake at a time. If you can’t come due to distance or another commitment, but you believe in this cause, there’s a way to get involved. Go to our school website and make a donation. In that way, you’ll be helping a student get to D.C., and when they March for Life, you’ll be marching with them. Isn’t that wonderful news? I love when we get affirmations such as these. That someone we admire, and have heard before, about a topic near to our heart, would come and speak and hopefully build the numbers involved is a huge thing!